I LOVE Kelly Moore bags, but I think my favorite is the Juju bag in either Muted Teal or Slate Grey. Hope I win, and thank you for this opportunity! hobo in gray. lovely. xoxo. Love the Libby in orange. Kelly Boy Grey. I have a new birthday gift idea now! The Kelly Boy Grey. I love the pursey made camera bag look for women but i'll always be a sucker for a gorgeous wear-all messenger bag. The classic in brown. It will never go out of style. These bags are great! Definitely going on my birthday wish-list. I like the b-hobo in teal! Love the Libby in orange (of course!). I absolutely LOVE the Muted Teal B-Hobo bag!!! I've wanted it for a long time now. I know my chances are slim, but I REALLY hope I win!!! Oooh, I love the B-Hobo in grassy green! Oh MY!!!!!! I simply adore the MIMI bag in grey!!! Eeep, I hope I win!!! I like 2 Sues in Raspberry. My cameras will look so cool in it! The Mimi Bag in Lavender!!!!!!! So amazing! My favorite is the Juju in slate grey. I have a good friend who is a budding photographer and would love to win this bag for her. I think she'd like the 2 Sues bag in gray. Those bags are so cute! I want one! I would love any of these. So pretty! Now I won't have any hesitation to bring my camera everywhere! The MiMi in black for sure! Love to have kelly moore B hOBo in musturd. Libby Bag in Caramel is gorgeous!!! Kelly Boy Bag in brown and 2 Sues in mustard!! Perfect! All these bags look amazing! But 2 Sues Bag l Mustard is in my type. Difficult to decide! I think i love the B-HOBO bag in grey at most. Wow great giveaway.. I love the classic bag in pink. Beautiful colour. These are so awesome - really stylish and functional. I like the B-Hobo and Posey bags in muted teal. I love the Kelly Boy in Mustard! I think my favorite is the hobo. In gray. So pretty. The mustard Kelly Boy. Swoon! I like the Posey Bag in Slate Grey. There are so many to choose from, I would be happy with any of them. I like the Classic in either purple, fuschia or black, depending on my mood, or maybe the kelly boy in either brown or black... but then the Libby is pretty cool too. So hard to decide! Ooh, the B Hobo in teal! Wow, those bags are gorgeous. Putting one on my wishlist for sure! These are so unique and pretty. I love the classic in purple. b-hobo bag in heather grey, please! hobo in red! very cool. I am loving the Libby bag in Orange and am keeping my fingers crossed!! Sent this link to my photographer friend Veronika! She'd love these bags! What great bags! I love the Kelly Boy in mustard. I LOVE the Classic bag in Cranberry Croc! So gorgeous!! I love the Classic Bag in Fuchsia! These are awesome! Perfect for a long day shoot! I would love to win a bag! My absolute favorite is the Grey Mimi bag.. Totally obsessed! I am so torn between the kelly boy and the libby...but I think the libby wins! In...orange! Awesome bags!!!! B-Hobo in mustard is exactly what I would choose as well! Love it! Thanks for the chance to win. My favorite is the Kelly Boy bag, but they're all wonderful! What a great giveaway! I love the classic bag. Not sure if it comes in grassy green, but that's the color I'd pick! Love it. eeek! the kelly in ORANGE! I love it. I've been looking for a new bag and if I don't win, this is going straight onto my Christmas wish list! Yay! These are gorgeous. I love the grey b hobo bag. I can't make up my mind . . . I'm in love with both the Classic Bag in Fuschia & the Kelly Boy Bag in Black. Decisions, decisions . . .
oh kelly moore. you are my favorite camera bag designer! my absolute favorite is the libby bag in caramel. oh it is so sweet and smooth just like the candy! i am soon making a move to australia and this would be so perfect to take all my goodies on the plane with me! safe & sound! Oh my gosh! I'm in heaven!What a hard choice... but the libby in orange is so fun! A difficult choice! But the Kelly Boy in mustard or brown would be the thing! Because of the should straps. Beautiful Kelly Moore bags --my preference is the Kelly boy bag in brown. thank you. the Libby in ORANGE of course! The MiMi! In orange, of course! Oops . . . forgot to leave contact info for when I win! Again, the MiMi in beautiful Orange! Beautiful, beautiful bags! 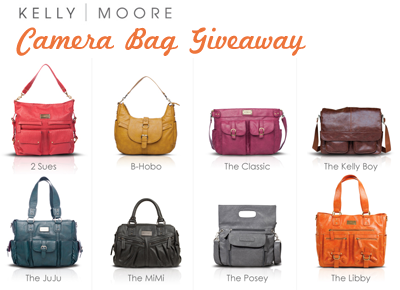 I like them all but I specially love the Libby bag in orange or sapphire. I LOVE the classic bag in rich fuchsia!! I love the B-Hobo in heather gray. These bags are so gorgeous! My favorite is the Mimi in black. I just love it! Wow, what a giveaway! It's obviously hard to choose just one, but I am drooling over The Libby in Caramel! The Libby bag in Lavender! Room for baby stuff and camera stuff - Love it! i love love love the b-hobo in walnut! Fantastic bags! The Kelly Boy Bag in brown is my favourite! Such beautiful bags! I love the one in brown! OMG!!! I just got a very nice 35 millimeter camera with a couple extra lenses and a flash thingie and all and have been searching for a bag to put it all in would love love love the MIMI in black!! Who decided a camera bag has to be ugly?? This is genius! I love the Libby bag in caramel! So chic! I'd love the Mimi bag in Lavender! would love this bag...just gotta buy my dream camera first! My favorite: 2 Sues in red. All of the bags are amazing! But if I had to choose I'd pick the LIBBY or MIMI in black. These bags are amazing! I'm having a hard time picking a favorite, but I think I would have to go with the libby bag in grey or black (goes with everything in a rather colorful wardrobe). Now, if you'll please excuse me, I need to go drool over the website some more. The Kelly Boy in brown would be perfect for work or play! Beautiful! The Posey in grey would be so dreamy! I'm very late but I will try: I love the 2 Sues Bag Walnut! Late to the party...but I had to try to win the b-hobo bag in heather grey. Stunning! These bags are such a great idea! I always struggle with how to carry my giant camera. Definitely love the Classic in purple. So fun for fall! I'm loving the B-Hobo in Grassy Green or Muted Teal. 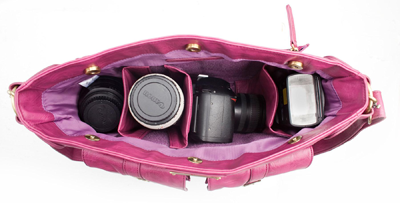 I've always loved Kelly Moore camera bags, and have been coveting one for a while. It's not easy to pick--but I'd have to say that my favorite is the Classic in Fuchsia! I've been eyeing the Posey in teal. I love everything from Kelly Moore!! I secretly check out the 2 Sues bag on my work computer about 3 times a day! Perhaps I think if I look at it long enough it will appear at my door! :) 2 Sues in Black or Grey is my favorite!! I would loveeeee any of her bags, but my heart is pretty set on the Mimi!! I absolutely love the Classic bag in purple! It is much better looking than my plain old Nikon bag! I think my fav is the Posey bag in teal... I think! I would LOVE the B-Hobo in Muted Teal. Gorgeous! Libby bag in sapphire! looks like it will hold all of my purse along with a camera! love it! I'm with you--the B-Hobo in mustard is stunning! I've always wanted a camera bag that doesn't scream rob me of my DSLR! being the tom boy that i am... the kelly boy bag in brown is uber fuctional and trendy!!! Kelly Boy in saddle bag brown...beautiful! One would never know it's a camera bag. I like the Kelly Boy Bag in brown. I adore the "mimi" in lavender...so pretty! I really like the B-Hobo, as to the color, I am torn between grey or teal. IN. LOVE. This is what I've been lookin'for. I love the juju in teal or slate gray! I would totally buy the hobo in mustard... It puts my nikon bag to shame! oh my i love the B-Hobo in heather gray! these are amazing! definately the 2 Sues in raspberry. What a pretty bag. Thank you for running this give-away! What an amazing give away! I love the Libby in gray or orange, but I don't think I'd say no to any of them!! Okay, I love all of those bags. But I'm a huge fan of the boy bag in brown! It would be a WONDERFUL present for my husband. :) You can find my contact info at my blog, which I linked here. 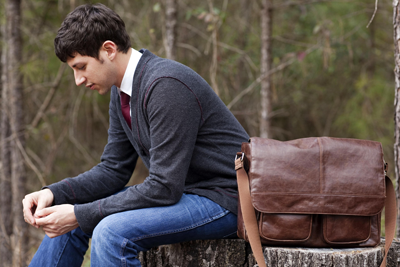 "This gentleman is reflecting on how he has no friends in the world, except for his trusty Kelly Boy bag." I am in love with the Kelly Boy, especially the Gray one. I love the Posey in Teal. Gorgeous colour! LOVE all of them, but especially JuJu in any colour really ... Or one of each if I had unlimited funds! They are all great, but the one I like best is 2 Sues. They are all terrific but I like the 2 Sue best. As a photographer who goes anywhere with gear, I love the idea of having a bag that doesn't scream I HAVE EXPENSIVE GEAR. While traditional gear is fun and a geek out way it would be nice to have something that was sleek and unassuming (thats meant as a compliment). I like the kelly boy bag (even is says its for dudes) because i could take my laptop and just the essentials. The grey is fab. I also like the JUJU - so many lenses fit! ohhhh....i love them all so much but i think my favorite is the B-Hobo, in any color. thank you for the giveaway! I think the Kelly Boy in that brown is just the cutest one up there! I like the Kelly boy and the Mimi. I adore the B-hobo in Grassy Green!, Thanks so much for this chance! Would LOVE the Libby in caramel! NEED the B-hobo bag in heather gray desperately. I would love so many different ones, but I think the Classic in Muted Teal is still my favorite! I love the classic bag in the new cranberry croc. Fabulous!! I NEED the orange Libby bag!!! love the b-hobo bag in muted teal! They are all great bags. Love all the bags but especially Libby in (what else) Orange. I have a 1 in 2764 chance of getting the hottest bag ever (ahem, the Classic in Rich Fuschia). I'd love the B Hobo, but any would do. Thanks for the chance. The B Hobo in grassy green is my favourite! So compact and in my most loved colour. Fantastic! I love these bags and can't wait to get one. The Posey Bag in slate gray will go so perfectly with my new camera and my new baby! the kelly boy bag in brown is lovely!! I think the Libby in Black would be VERY versatile!!!! All of these bags are gorg! But I have to say the Classic in Rich Fuchsia is my fave...what a great bag. Thanks for the giveaway! Oh wow...i love the Kelly Boy in either brown or mustard. Thanks for the giveaway! I love the B Hobo is grey! I would love the Libby bag in orange or grey!!! I just adore the Kelly Boy bag in brown! Every bag I buy has to be able to hold a lot of stuff--because I hate to be bored and I like to be prepared for anything. If ever I end up stranded in a small confined space or an a deserted island--everyone is going to want to be my best friend! What wonderful bags! The Posey Bag in slate grey is lovely! I can't decide if my favorite is the B-Hobo or the classic - they are both fabulous! I would love one in a bright color - that fuschia is gorgeous! Great give-away! I like the B-hobo. It is not that big, my camera equipment is small. AHHHH.....I think that my comment didn't load! I love these bags! I now have a new obsession! I'm glad I found the perfect kelly moore bag on your blog! I love the 2 sues bag and the classic bag. 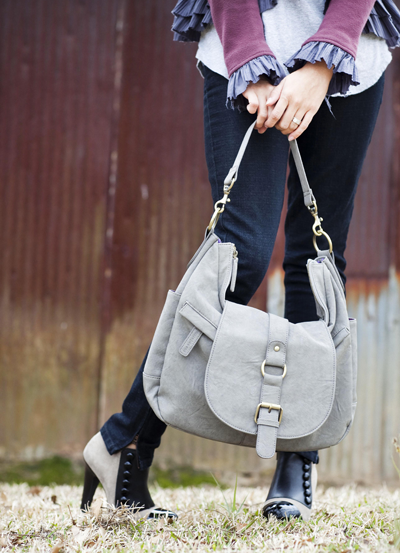 I <3 the B-Hobo in heather grey. These bags are amazing!!! I love the 2 Sues in Black. Thanks for the chance to look classy while lugging my camera around!!! These bags are so beautiful it's almost impossible to choose! My favorite is the B Hobo in walnut. Wow! If I had only known there were awesome camera bags out there! LOVE LOVE LOVE The Libby bag! The orange just pops!! It would have to be the Kelly Boy in brown. So perfect for wandering around the city. most certainly interested! love this! the b-hobo in walnut! delicious!! My favorite would for sure be the Kelly Moore Libby in Orange! I fell in love with it the day I saw it in a camera store!